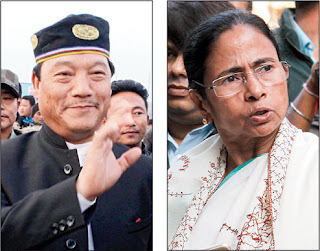 Bimal Gurung, the Gorkha Janmukti Morcha chief, today dared Mamata Banerjee to contest from one of the three Darjeeling hill seats in the coming Assembly elections, saying he would then prove a point to the chief minister.
" Abhi main unko request karna chahunga ke anewala MLA chunao mein in tino mein se ek seat me unko larna chahiye. Tab main dikhaunga (I am requesting her to contest from one of the three seats from here. Then I will show her)," Gurung told journalists at Sukna this evening where he had come to attend the final of a football tournament organised by a local sport association. The three hill constituencies are Darjeeling, Kurseong and Kalimpong. The Morcha won all three seats in the last Assembly elections but right now holds none of the seats. Harka Bahadur Chhetri, the Kalimpong MLA resigned from the Morcha but not from his seat, making him an Independent MLA. Chhetri, who has announced that he plans to float his political outfit on January 27, by not quitting the seat violated a Morcha whip to its three MLAs to quit their seats to protest the state's high-handedness. Of the other two MLAs, Rohit Sharma, who was the Kurseong legislator, gave up his seat as the party had instructed. Trilok Dewan, the Darjeeling MLA quit the House seat and the party. Both Chhetri and Dewan said Gurung was dictatorial. In the hills, Trinamul has found few takers because it is not perceived to be a local outfit. Since quitting the party, Chhetri has started campaigning against the Morcha and was seen on the dais with the chief minister during her recent visit to the hills last week. Asked if he was throwing a challenge to Mamata, Gurung ridiculed her dream to turn Darjeeling to Switzerland.
" Unko itna pasand hai na Darjeeling. Switzerland banayenge, aur kya banayenge. Switzerland to nahi bana, Murdaland ban raha hai (She loves Darjeeling so much. She wants to make it Switzerland and what not. Switzerland is a far cry, this is becoming a wasteland)," he said. "Whenever she visits Darjeeling, she gives us sorrow and pain. It seems her only work is to visit Darjeeling. There is no development in Bengal, and for Darjeeling, it is divide policy. So far, she has done nothing for the hills," he reacted, when he was asked about the formation of development boards of different sections hill communities. Accompanying Gurung to the outskirts of Siliguri were Morcha general secretary Roshan Giri and Rohit Sharma. The Morcha leaders will also attend the organisation's Terai unit's meeting at Dagapur on Monday. "We will attend our organisation's Terai and Siliguri sub-divisional committee's meeting tomorrow. We are going to reshuffle it. As the Assembly polls are approaching, it is obvious that we have to work on our organisation as well, so that it can function in the plains also," Gurung said. After Chhetri's departure from the party, two of the Morcha's central committee members from Matigara-Naxalbari area resigned from the party.